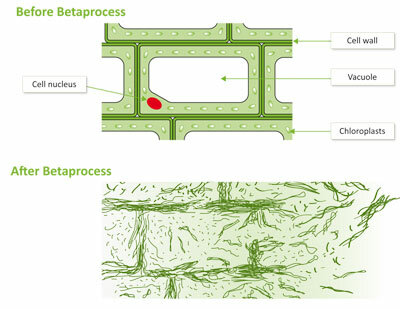 Betaprocess operates according to vacuum extrusion technology. Crushed biomass is brought into a reaction vessel, where a reaction takes place under vacuum conditions at a temperature between 60 and 65°C. During this reaction the cells of the biomass material ‘explode’. Hereby, the fibres, cell walls and cell membranes are ripped apart, so that bacteria and enzymes obtain direct access to the sugars and other cell ingredients. Moreover, this causes a change in the molecular structure of different substances and their release. This effect facilitates and accelerates massively bacterial activity, fermentation, and thereby the formation of gas and ethanol. This results in a much more efficient production process generating higher gas yields, gas with higher methane content, higher ethanol yields, while leaving less digestate. This is a graphic representation to give you an impression of the overall effect.